Bruschetta one of the the typical Italian "antipasto"
Bruschetta is an antipasto (starter dish) from Italy consisting of grilled bread rubbed with garlic and topped with olive oil and salt. Variations may include toppings of tomato, vegetables, beans, cured meat, or cheese. 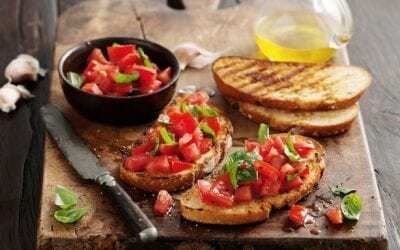 Bruschetta is a fresh, simple and delicious Italian appetizer that can be prepared in minutes and enjoyed any time of the year. Grill the bread slices over a moderately hot fire until they are nicely toasted on both sides, turning frequently to ensure even browning. Be careful not to burn them; they will cook in only a few minutes. Rub each slice of bread while it is still hot with the exposed inside of the clove, squeezing the garlic between your fingers to release its juices into the bread. Now drizzle your bread liberally with your fruity olive oil. The slices should be nicely soaked. Salt the slices to taste. If you want, you can top each slice with the tomato mixture, which you make by mixing together all of the ingredients mentioned above in a bowl right before you serve your bruschetta.